Cell radios and carriers can be very confusing sometimes. Rather than sitting in the dark any longer, though, user Jim Amos decided to ask our community to help him figure out the differences between CDMA and GSM radios. He's already got his answer, but maybe you'd like to see it as well. Who wants to spend $70 on a keyboard for the TouchPad when you can just used your webOS Smartphone keyboard to get the job done? While we aren't entirely sure why you would want to use the much smaller keyboard on a smartphone over the virtual keyboard in the TouchPad, some users, including jsabo, would love to see an app/patch made that would allow you to type on your new TouchPad using your Pre 2, Veer or Pre 3. That would be a neat trick, for sure, but it's not made yet. Why not see if you can give the people a hand? Speaking of the TouchPad, one of the biggest features that will be coming with it and the release of the Pre3 (or an updated Veer OS) is Touch-To-Share, which allows you to transfer data from one device to another simply by touching the two together. As bikeguychicago reminds us, though, we haven't seen much else demonstrated with Touch-To-Share besides transferring web pages and he asks a very straight-forward question: What else can it do? While the webOS healthcare world continues to mourn the loss of Epocrates, Michelle from Lexicomp joined our forums for a single post to remind us that her company was still very dedicated to the webOS ecosystem. Does this mean we'll be seeing more updates and apps from the company to fill the gaps left by Epocrates? Let's hope so. Lastly, if you're a twitter user (and many of you are), David Strack has released a brand new Twitter app that he calls Phnx (pronounced Phoenix) to the masses. What was once a side-project found in the beta feed is now a full-scale app in the official webOS Catalog. We're giving it a try right now, and will be bringing you a review very soon, but until then check out his thread and buy the app from the catalog for a $1.49. 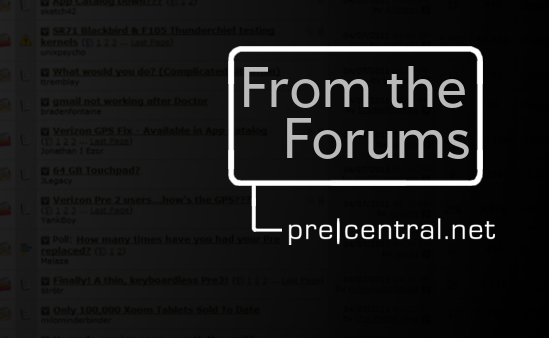 There is a whole lot more going on in our Forums, though, and your voice is always needed. Register for free and join in the discussion, maybe next time your posts will be added here!